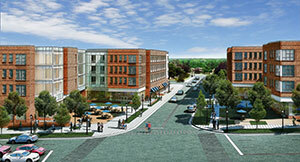 A rendering of the west corner of Spartan Village Student Housing Phase II. 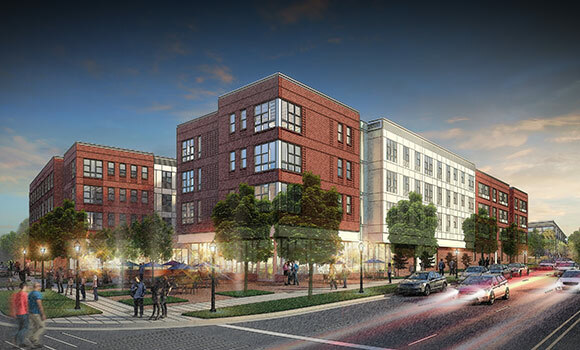 UNCG continues to expand its presence on West Gate City Boulevard with Spartan Village Student Housing Phase II, a new $50.9 million mixed-use project featuring two residence halls and 26,000 square feet of retail space. Spartan Village, which opened in 2013 with four Student Housing Phase I residence halls, was developed in response to the university’s need to provide more on-campus housing for the growing student population. When Phase II opens next fall, approximately 1,200 students will live in Spartan Village, which is adjacent to the new Leonard J. Kaplan Center for Wellness. An aerial rendering of Spartan Village Student Housing Phase II. The two new residence halls – with space for 330 beds – will offer two-bedroom apartments with one or two bathrooms. The grocery store and restaurants will accept UNCG Dining FLEX dollars, and many of the retailers will be open late and deliver to campus. The new retail space will also provide employment opportunities for students and members of the Glenwood neighborhood. Additionally, Phase II will provide a critical link between the Kaplan Center and the Phase I residence halls. Pedestrian walkways will connect all residence halls to the Kaplan Center and the signalized crosswalk on West Gate City Boulevard, which leads students to the UNCG Pedestrian Underpass. The underpass connects Spartan Village, the Kaplan Center and the UNCG Police Station with the rest of campus.